Thirty-seven people have been killed after a 6.3 magnitude earthquake struck near Bushehr in Iran. Around 850 people have been injured, according to Iranian media. The area is home to the Bushehr nuclear power plant. At least 37 people had died so far and 850 were injured, including 100 who were hospitalized, Bushehr provincial governor Fereidoun Hasanvand told state TV. "Based on the most recent figures on the impact of the earthquake," said deputy governor of Bushehr province, Shahpour Rostami, as quoted by Fars news agency. Iran has announced a three day mourning period for those killed in the earthquake, according to Interfax. The quake's epicenter was 89 kilometers (55 miles) away from the nuclear plant, just outside the town of Kaki. Eighty to 100 per cent of the town's homes have been destroyed, Itar-Tass reported. The depth of the quake was 10 km (6.2miles). It was followed by 21 aftershocks within three hours. Twelve of those measured above 4 on the Richter scale. "We could clearly feel the earthquake," a local resident told Reuters. "The windows and chandeliers all shook." The villages of Shanbe and Sana have been heavily damaged, according to a Red Cross official. Reports on Twitter say that 23 villages have been affected in total. 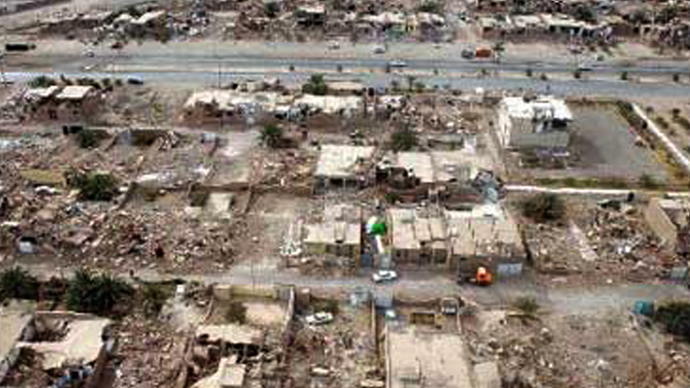 More than 700 homes have been completely or partially destroyed, Mehr news agency reported. Many houses in rural parts of the province are made of mud brick, which can easily crumble in an earthquake. The Bushehr nuclear plant, which is located just 11 miles southeast of the city, remains unaffected. The governor of the province has also confirmed that the plant is undamaged. The UN's International Atomic Energy Agency (IAEA) says that Iran told it that the earthquake caused no damage to the facility. "Iran has informed (the IAEA's Incident and Emergency Centre) of the event, reporting that there has been no damage to the Bushehr Nuclear Power Plant and no radioactive release from the installation," the agency said in a statement, as quoted by Reuters. Based on this information and the IAEA's own seismic analysis of the earthquake's magnitude, location and other factors, the agency "is not currently seeking additional information from Iran," the statement added. People on social media reported feeling the quake as far as in Dubai and Abu Dhabi. Gulf Arab countries and Western experts have voiced concerns about the Bushehr plant, which is built in a highly seismic area. Iran has repeatedly denied allegations that it could be unsafe. The IAEA said during a 2012 visit to the facility that it was indeed safe. "I, as the head of the [inspection] team, assure the Iranian society that Iran's installations are safe," Head of the IAEA's Nuclear Safety and Security Department, Olena Mykolaichuk, said in a statement. The port city of Bushehr, which is home to around 160,000 people, is located on Iran's southwestern coastal region. Iran extends across several major faults in the earth's crust, and is prone to frequent earthquakes. In August 2012, two quakes in the north-west of the country claimed the lives of 306 people and injured more than 4,500 others. Earlier Tuesday, Iranian state TV announced that the country has begun operations at two uranium extraction mines and a new uranium production facility. The announcement comes amidst a heated international row surrounding Tehran's nuclear intentions. The US and its allies claim that Iran is using the program as a cover to secretly build a nuclear weapon. Tehran denies the allegations, stating that its nuclear endeavors are for purely civilian purposes. The Islamic Republic says its nuclear program is necessary to produce energy, as well as isotopes for research and medical devices.